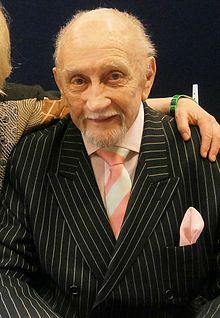 Roy Dotrice, OBE (26 May 1923 – 16 October 2017) was a British actor. He was known for his Tony Award-winning Broadway performance in the revival of A Moon for the Misbegotten. Dotrice was born in Guernsey on 26 May 1923. One of his daughters, Michele, was famous for playing the role of Betty, the wife of Frank Spencer in the BBC sitcom Some Mothers Do 'Ave 'Em. Dotrice recorded audiobooks for each book in George R. R. Martin's series A Song of Ice and Fire. He earned a place in the Guinness World Records in 2004 for the highest number of character voices by a single actor for the first book in the series, A Game of Thrones (in which he voiced a total of 224 characters). Dotrice died on 16 October 2017 in London at the age of 94. ↑ "Some Mothers Do 'Ave 'Em". comedy.co.uk. Retrieved 17 October 2017. ↑ "Most character voices for an audio book - individual". Guinnessworldrecords.com. Retrieved 16 October 2017. ↑ "Game of Thrones: News - Roy Dotrice is Pycelle and More". Westeros.org. Retrieved 24 February 2016. ↑ "Veteran British actor Roy Dotrice dies aged 94". Washington Post. Retrieved 16 October 2017. ↑ "Game of Thrones star Roy Dotrice dies aged 94". ibtimes.co.uk. 16 October 2017. Retrieved 16 October 2017.